Santner to Butler and it’s a six, NZ 9th ODI unbeaten streak at home was smashed. This is what happens if you give four wickets in run out. This post is not about the previous match. This post is fully dedicated to Today Dream11 Fantasy Cricket Prediction Of NZ V ENG 3rd ODI. To win in dream11 fantasy cricket league you must have proper knowledge of cricket, playing condition, likely 11, pitch report, the player past performance. Crix11 will provide you all the details, dream11 tips and tricks, who will win the match, toss prediction and what astrology has to say about the 3rd ODI between Nz vs Eng. You just need one thing, read the whole post so that your winning chance increases to 100%. Who Will Win The 3rd ODI, NZ v ENG? 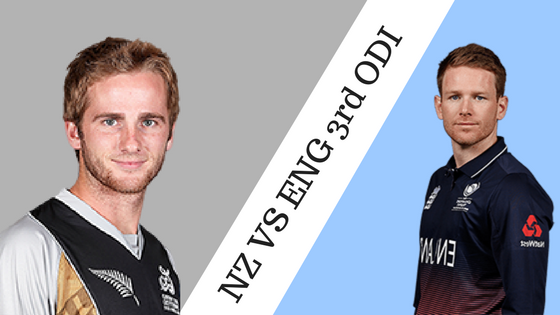 Match: England Tour of New Zealand, 2018, NZ v ENG, 3rd ODI. Average second inning score is 205. Highest total on this ground was 393/6 in 50 overs by NZ v WI. Lowest total on this ground was 89/10 in 37.2 overs by Eng v NZ. Last ODI played here was between South Africa and New Zealand. It was a nightmare for Black Caps. The whole team just got out in 112 runs in 32.2 overs. Grandhomme was the highest scorer on that match. He scored 34 runs. The Pitch of Westpac Stadium supports seamers. The team batting first will have good opportunity to score as the pitch will support the batsman in the first inning. The highest wicket taker of this ground is Southee. He took 24 wickets. There is not much for the spinners in this ground. New Zealand and England have played 3 matches against each other on this ground and all the three games were won by Black Caps. You will be surprised to know that England team has never won on this ground. This record may turn out as an advantage for NZ. The weather of Wellington is predicted to be partly cloudy. There is no rain predicted on the match day. The maximum temperature is expected to be 23-degree Celsius and minimum to be 18 degrees. Tom Latham (wk), Mark Chapman, Colin Munro, Kane Williamson (c), Trent Boult, Mitchell Santner, Ross Taylor, Henry Nicholls, Colin de Grandhomme, Matt Henry, Martin Guptill, Lockie Ferguson, Ish Sodhi, Todd Astle, Tim Southee. Joe Root, Jason Roy, Eoin Morgan, Alex Hales, Jonny Bairstow, Jos Buttler, Moeen Ali, Ben Stokes, Tom Curran, Adil Rashid, Craig Overton, Mark Wood, David Willey, Chris Woakes, Sam Billings. Black Caps struggled in the 2nd ODI without Williamson, Kane has proved his fitness and will play in the 3rd game. NZ may consider Sodhi or Todd Astle in place of Lockie Ferguson. Martin Guptill, Kane Williamson (c), Colin Munro, Mark Chapman, Henry Nicholls, Tom Latham (wk), Tim Southee, Trent Boult, Colin de Grandhomme, Lockie Ferguson, Mitchell Santner. Bairstow was injured in the 2nd ODI but he is fit to play for the 3rd ODI. England may not want to change their winning combination but they may think of replacing Curran as he was very expensive in last two games. Jason Roy, Joe Root, Jonny Bairstow, Eoin Morgan, Jos Buttler, Ben Stokes, Chris Woakes, Adil Rashid, Mark Wood, David Willey, Moeen Ali. We have divided the key players on the basis of their role, for example, wicket keepers, batsman, all-rounders, and bowlers. In this section, we have provided you the detailed stats and recent performance of the players. Jos Butler: In the last two matches Butler has scored 115 runs which are highest score for England in this series. In the last game, he scored 36 runs. He has contributed 36 points in the last match. 71.14% of the fantasy users have selected him for the current match. Tom Latham: Latham has scored 101 runs till now in this series. His last match score was 22 runs. He has contributed 13.5 points in the last match. 28.86% of the dream11 fantasy cricket league users have selected him. Pro Tips: Select Tom Latham for the grand league as very few users have selected him. If you are playing with multiple teams make a combination. For example, take Latham in one team and butler in another team. Kane Williamson: Williamson didn’t play the last game as he was injured but he is set to play this match. He has scored 8 runs in the 1st ODI. Only 19.71% of the users have selected him in their team. Joe Root: Root just scored 9 runs in the last match but in the first game he has scored 71 runs. He contributed 7 points in the last match. 77.85% of the users have selected him in their fantasy team for the current match. Martin Guptill: Last inning Guptill played, scored 50 runs. He contributed 31.5 points in the last inning. 77.58% of the users have selected him. Eoin Morgan: Morgan has scored 62 runs in the last game. He contributed 41 points. In the current match, 64.59% of the users have selected him. Colin Munro: Munro has scored 7 runs in total and took 2 wickets in the last 2 innings. He has contributed 18.5 in the last inning. 57.28% of the users have selected him in their team for the 3rd ODI. Jason Roy: Roy has scored 57 runs in this series. He has just contributed 15 points and 38.32.% have taken him in their squad. Mark Chapman: Chapman only scored 1 run in the last inning and has contributed with 2.5 points but if we look at his recent performance in domestic cricket it is impressive. 6.35% have chosen him in their playing 11. Jonny Bairstow: Bairstow scored 37 runs in the last inning. He contributed 28 points. In the current match, 25.23% have selected him. Pro Tips: For the grand league, keep middle order batsman in your team as the pitch will support seamers, the openers will not contribute many runs. For multiple teams make a combination from the above list. Ben Stokes: Stokes has been awarded as a player of the match in the 2nd ODI. He has scored 63 runs and took 2 wickets in the last ODI. He has contributed with 72 points, which was highest among all. 90.32% have selected him in the current match. Chris Woakes: If we look at Woakes he has dismissed 2 batsmen in both the ODI’s. He has contributed 30 points in the last game. 63.86% have selected him in their team. Mitchell Santner: Santner has been the savior for Black Caps in the last two matches. Till now he has scored 108 runs and took 2 wickets in this series. He has contributed 43.5 points. 77.5% have taken him in their dream11 team. Pro Tips: Take all three on your team as they are the most valuable players in this series. If you playing with multiple teams you may consider Grandhomme. Trent Boult: Boult has dismissed 4 players till now, 2 wickets in each match. He has contributed 29 points in the last game. 90.72% players have selected him for 3rd ODI. Tim Southee: Let me remind you guys, Southee took 7 wickets against England in the World Cup 2015. Last game contribution was not good but you cannot ignore him. 56.82% have selected him in their team. Mark Wood: He didn’t play the last two games as he was injured but there is a huge chance that he will play 3rd ODI. 5.48% of the fantasy users have selected him in their team. Lockie Ferguson: Ferguson Scored 19 runs and took 1 wicket in the last ODI. He Contributed 24.5 points in the previous match. In the current match, 31.57% have selected him. David Willey: Willey’s performance was not up to the mark. In last two games, he took only 1 wicket. He contributed 12 points. 67.5% of the users have chosen him for the current match. Pro Tips: Try to keep Boult, Southee, and Mark Wood in your team for the grand league. If you are playing with multiple teams make different teams taking players from the above list. Pro Tips: Ben Stokes, Trent Boult, and Tim Southee seems the good option for Captain and Vice-Captain in the grand league. For multiple teams select from the above list. Both the teams will definitely want to improve their record in this pitch. According to Astrology New Zealand will win the 3rd ODI. The crix11 team predicted that New Zealand will win the toss and they will decide to bat first as this pitch is good for batting in the first inning. Seamers will be benefited in the 2nd half of the match. This team is just an example of the grand league, although you and keep this team for the small league. Conclusion: This is what we have got in Today Dream11 Fantasy Cricket Prediction Of NZ V ENG 3rd ODI. We will love to hear our readers expert opinion on the post. Feel free to give your valuable feedback in the comment box.